Jeparit is a rural township in the Wimmera region on the road and railway line from Dimboola to Rainbow. It is 70 km north-west of Horsham and 300 km north-west of Melbourne. Jeparit is situated in the former Lake Hindmarsh pastoral run (1846), and the lake's southern shore is about 5 km northwards, where the Wimmera River enters it. Farm allotments were occupied from 1888 onwards, and in 1889 local leaseholders, John and Arthur Scott, surveyed a site for a township. The name given to the township was that of the parish, Jeparit, thought to be derived from an Aboriginal word meaning a small beard or place for small birds. A school and a Presbyterian church were opened in 1889 and 1891. By 1893 there was a store (1889), a blacksmith, a hotel and two newspapers. 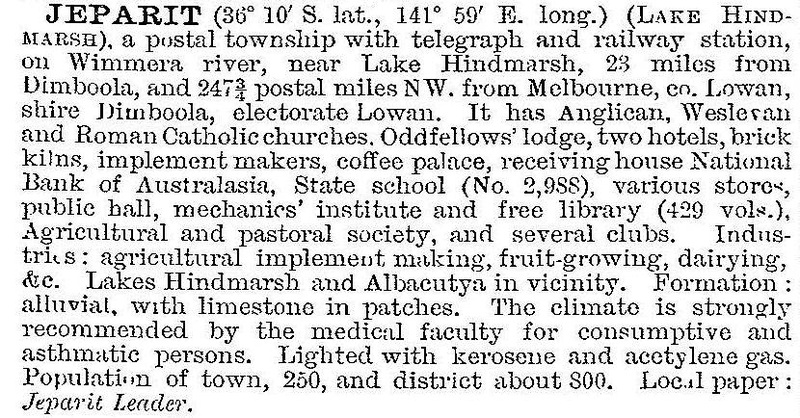 Activity quickened with the extension of the railway from Dimboola in 1894. A mechanics' institute and a Methodist church were added, and the Jeparit Cash Store was taken over by James Menzies. Later that year Menzies' fourth child, Robert Gordon, was born in quarters behind the store. James was later a councillor and President of Dimboola Shire; his son was later Victorian Attorney-General and Australian Prime Minister. He is memorialised by a spire and the Sir Robert Menzies park. In 1912 the railway line was extended westwards from Jeparit to Yanac. This made Jeparit a junction, as the line had also been extended northwards to Rainbow (1899) and further on to Yaapeet (1914). The lines were mainly for freight, wheat and other cereals. Jeparit was in Dimboola Shire, and the shire offices were at the southern end of the shire at Dimboola. In 1914 a more central location was chosen, and the offices were transferred to Jeparit. In 1925 new offices were built with the Memorial Hall. Jeparit's population stayed at about 700 people during the 1930s-1960s. As a minor decline set in, local townspeople, becoming concerned about the passing of pioneering residents and farm technology, began to assemble the Wimmera-Mallee Pioneer museum. The Albacutya homestead, Werrap hall, Tarranyurk hall, Woorak church and a blacksmith's shop from Antwerp were moved to the museum site. A comprehensive collection of farm implements and equipment is also displayed. Declining wheat prices have caused farms to be sold since the 1980s. Salinity has affected the Wimmera River, Lake Hindmarsh and some farms. The population was reported to be ageing: the hospital has thus been kept, but a school population of about 50 (1988-98) was half the 1983 figure. In 2014 it had 33 pupils. Jeparit has the Sir Robert Menzies park, tennis, bowling and swimming facilities, four churches, a hotel, a caravan park and a main street (named Broadway) with a linear reserve and war memorial. The river is on Jeparit's western edge. Lake Hindmarsh dried out in 1996, not refilling until 2009-10. In September 2010 and again in January 2011 many parts of regional Victoria experienced widespread severe flooding. In Jeparit floodwaters from the Wimmera River isolated the town and threatened the town’s levee. An emergency relief centre was opened at Jeparit Memorial Hall. Contents of the town’s museum was packed into shipping containers and moved to higher ground with historic vehicles and farm machinery. The record rains in January 2011, however, boosted flows in the Wimmera River and diluted a serious salinity level. Jeparit looked forward to the renewal of boating, fishing and tourism.